In the pig, protein digestion begins in the stomach with the action of pepsins, secreted as the enzyme precursors - pepsinogens - by stomach mucosa. Conversion of pepsinogen to pepsin occurs rapidly at pH 2.0 but only slowly at pH 5.0 to 6.0. In turn, pepsins work best in an acidic environment, pH 2.0 to 3.5, and activity declines rapidly above this pH. Carbohydrate hydrolysis in the stomach occurs by the action of salivary amylase, which, in contrast to pepsin, is inactivated once pH falls to 3.5 [14, 18, 22]. In the suckling pig, acid secretion is low and the principal source of acidity is bacterial fermentation of lactose from sows milk to lactic acid [9, 10, 14]. A high level of lactate in the stomach tends to inhibit HCl secretion [10, 22]. Ingestion of solid feed reduces the level of lactic acid in the stomach  and stimulates HCl production [10, 7] but, in practice, creep feed consumption is low and variable at least up to four weeks of age . At weaning, a combination of low acid secretion, lack of lactose substrate, and consumption of large meals at infrequent intervals can result in elevated pH, often to over 5.0 and it may remain high for several days . The high acid-binding/buffering capacity of the feed (its ability to neutralise feed acid) helps to further raise the stomach pH [20, 13, 6]. Inclusion of whey or lactose in the starter diet ensures continuation of bacterial fermentation and some, though reduced, lactic acid production [14, 11]. Development of HCl secretory capacity occurs more rapidly in the weaned pig than in the suckling pig . Lowering the acid-binding capacity of diets for newly-weaned pigs can help ease the transition from milk to solid food at weaning. Raised stomach pH after weaning results in reduced digestion of feed which will then be fermented in the hind gut and may provoke diarrhoea. A high gastric pH will also allow pathogens to survive and allow them greater opportunity to colonise the digestive tract [6, 22]. The concept of manipulating stomach acidity by adding acid to feeds or using feeds of low acid-binding or buffering capacity [20, 13, 6, 16, 17] has been around for a long time and addition of organic acids to piglet starter feeds is a common practice. However, there is little information on the acid-binding capacity (ABC) of ingredients that are used in formulation of complete feeds. The limited published sets of data have been compiled using methods with different titration-end points (e.g., pH = 3.0 or pH = 4.0) so that values are not comparable [20, 13, 6, 12]. The objective of this study was to find the ABC and buffering capacity values of individual feed ingredients and ingredient categories and to find if a correlation exists between ABC-3 and ABC-4 values. A further objective was to investigate the possibility of formulating complete diets of low ABC for weaned pigs by using the ABC values of each ingredient in the formulation matrix. Ingredients commonly used in pig rations were obtained over a number of years from various commercial sources in Ireland. All ingredients (as received) were ground through a 2 mm screen using a laboratory hammer mill (Christy and Norris, Scunthorpe, UK), and were stored in air-tight jars at room temperature until analysis. Measurements were completed within one month of receiving each sample. Ingredients were grouped under the following headings for ease of analysis: (i) milk products, (ii) cereals, (iii) root and pulp products, (iv) vegetable proteins, (v) meat and fish meal, (vi) medication, (vii) amino acids, (viii) minerals, (ix) acid salts, and (x) acids. A modification of the procedure of Jasaitis et al. was used to determine pH and acid-binding capacity (ABC). 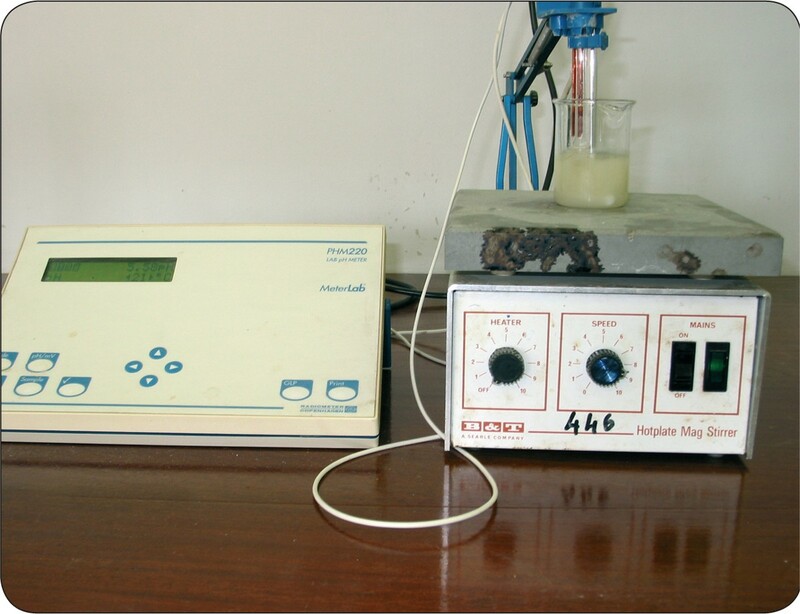 The latter procedure used only pH = 4.0 as the titration endpoint whereas the present study used pH = 3.0 as well as pH = 4.0 as titration endpoints in an effort to provide measures of greater relevance to pig nutrition. All pH measurements were made using a laboratory pH meter (PHM 220, Radiometer, Copenhagen) which was calibrated using certified pH = 4.0 and pH = 7.0 buffer solutions (Radiometer, Copenhagen). A 0.5 g sample of ingredient/feed was suspended in 50 ml of distilled and de-ionised water and continuously stirred with a magnetic stirrer. Titrations were performed by addition of acid (0.1N HCl) in variable increments (0.1 to 10 ml depending on the ingredient type and the stage of titration). Acid was added so that it would take approximately 10 separate additions of acid to reach pH 3.0. Initial pH and all further readings taken during the titration were recorded after equilibration for three minutes. ABC was calculated as the amount of acid in milliequivalents (meq) required to lower the pH of 1 kg of sample to (a) pH 4.0 (ABC-4) and (b) pH 3.0 (ABC-3). The buffering capacity (BUF) was calculated by dividing the ABC by the total change in pH units [from initial pH to the final pH of (a) 4.0 (BUF-4) and (b) 3.0 (BUF-3)]. BUF expresses the amount of acid required to produce a unit change in the pH of a feed ingredient/feed sample. Feeds/ingredients with a pH less than 3 or 4 were titrated as above but against 0.1 N NaOH until pH 4.0 and/or pH 3.0 was reached. ABC and BUF values in these cases were given negative values. The means and standard deviation for each ingredient were calculated for pH, ABC-4, ABC-3, BUF-4 and BUF-3. Regression equations (Proc Reg of Sas Inc., Cary, North Carolina) were established relating ABC-3 to ABC-4 for the ingredients within each category. This procedure was also used to establish the relationship between the predicted and observed ABC-4 and ABC-3 values for 34 mixed pig diets. Predicted values were obtained by including the ABC-4 and ABC-3 values of each individual ingredient in the formulation matrix for the mixed diet. The mean ABC and BUF values for each ingredient are shown in Table 1. The mean ABC of each category and the correlation between ABC-3 and ABC-4 values for each category are shown in Table 2. The correlation between predicted and observed ABC values for 34 post-weaning diets is presented in Table 3. 1Number of samples. 2Dependent variable. 3Regression constant. 4Regression coefficient for regression on ABC-3. 5Coefficient of determination. 6Adjusted R2. 7Residual standard deviation. 1Number of samples. 2Dependent variable. 3Regression constant. 4Regression coefficient for regression on predicted ABC-4 or ABC-3 value. 5Coefficient of determination. 6Adjusted R2. 7Residual standard deviation. Initial pH, ABC-4 and ABC-3 varied greatly between individual ingredients. Categories of ingredients were statistically different (P < 0.01) with regard to ABC and BUF values but great variation was also found within ingredient categories for initial pH, ABC and BUF. Acid salts and minerals were the categories that had the highest ABC and BUF values. Great variation occurred between the different mineral types. Zinc oxide, limestone flour and sodium bicarbonate had the highest ABC values. Of the phosphorus sources, defluorinated phosphate had the highest ABC values, dicalcium phosphate and mono dicalcium phosphate had intermediate values, while monammonium phosphate had the lowest values. Meat and fish meal, milk products, amino acids, root and pulp products and vegetable proteins were the categories of organic ingredients with the highest ABC and BUF values. Cereals had the lowest values of the organic ingredient categories. Of the ingredients, both inorganic and organic, the acids category had the lowest ABC and BUF values. Most ABC values for the individual acids were negative with orthophosphoric, fumaric, formic, malic and citric acids having the most negative values. The mean ABC-3 and ABC-4 values for ingredients within categories are well correlated. R2 values of 0.90 or greater were found for milk products and medication. R2 values of between 0.85 and 0.90 were found for amino acids and minerals. Both vegetable proteins and meat and fishmeal had R2 values of between 0.80 and 0.85. The ABC values for mixed pig starter diets were predicted from the mean ABC value (Table 1) of each ingredient in their formulation and their composition in the diet. The correlation between predicted and observed ABC values was relatively good. For ABC-4, R2 was 0.83 and for ABC-3 the R2 was 0.71. Some ingredients bind more acid in the stomach than others and for this reason their use in pig starter diets might result in a high gastric pH. A high gastric pH is detrimental to the pig because it allows the proliferation of deleterious micro-organisms  and inhibits protein digestion [14, 18, 22]. 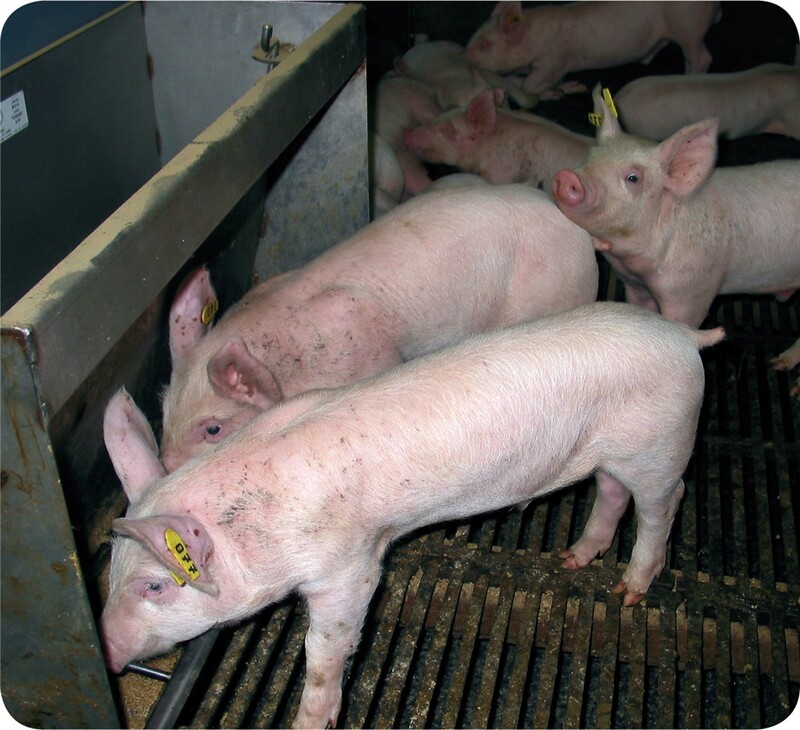 In the present study, a range of ingredients that are commonly used in pig diets was examined. It was thought that ingredients of low ABC would be identified which could then be used to formulate a starter diet in such a way that gastric acidity would be promoted. Jasaitis et al. found that mineral additives had higher ABC-4 and BUF-4 values than organic ingredients. In the present experiment, minerals as an ingredient category had the second highest ABC and BUF values of all categories examined. Acid salts were found to have the highest values. Jasaitis et al. found that carbonates and dibasic or tribasic mineral additives had the highest ABC and BUF values. With the exception of the trace minerals zinc oxide and manganese oxide, the present experiment agrees with this finding. Limestone flour and sodium bicarbonate had the highest ABC values with defluorinated phosphate, dicalcium phosphate and mono dicalcium phosphate being the minerals with the next highest values. Bolduan  found that increasing the mineral supplementation of a diet from 0 to 4% tripled the ABC-4 value. For this reason, Bolduan et al. and Bolduan  suggested limiting the mineral content of a starter diet for a short period postweaning. It was hypothesised that this practice would benefit the pigs in health terms. However, growth may be retarded to some extent by this practice as the mineral requirement for bone formation will not be supplied  especially if the period of restricted feeding of minerals is prolonged. With regard to organic ingredients, their ABC values are positively correlated with their ash and protein contents [13, 6, 5]. Prohaszka and Baron  also found the ABC-3 of a feed to increase as its protein content increased. In the present experiment, meat and fishmeal had the highest ABC and BUF values of all the organic ingredients. This was thought to be because of their high ash and protein contents. Jasaitis et al. also found these ingredients to have the highest ABC-4 values of all organic ingredients. The milk products category (in particular, rennet casein and spray dried skim) also had high ABC values. However, the other ingredients in this category had lower values. Again, this is believed to be related to the ash and protein contents. Of the vegetable proteins, soyabean meal, Soycomil, rapeseed, and sunflower meal had the highest ABC values. Jasaitis et al. found that the geographic origin of an ingredient can affect its ABC because it influences the ion concentration of the ingredient and this may help to explain the variation in ABC values found for individual ingredients. Maize gluten and milo distillers meal were uncharacteristic of the vegetable protein group of ingredients in that they both had pH values less than 4.5 and their ABC values were low relative to the other ingredients in this group. Jasaitis et al. also found such fermented products to have some of the lowest ABC-4 values of the organic ingredients examined. Cereals and some root and pulp products had low ABC and BUF values in the present experiment. This was in agreement with previous findings ([13, 5, 6] and ). Acids were found to have negative ABC values. The use of organic acids in starter diets offers the opportunity of lowering diet ABC without having to reduce dietary protein or mineral content. However, the beneficial effects of organic acids on pig health are strongly dependent on the initial BUF value of the diet . The organic acids of choice would be orthophosphoric, fumaric, formic or malic if the prime mode of action of these acids was deemed to be the lowering of diet ABC and increasing gastric acidity. However, acids for use in pig diets are often selected for other qualities also such as: antimicrobial effects on pathogenic bacteria, promotion of beneficial or probiotic bacteria, nutritional value, improved non-specific immunity , stimulatory effect on pancreatic secretion (e.g., lactic acid: ), physical form (dry or liquid), corrosive nature and safety. In the literature, ABC-3 values were used by some researchers  while ABC-4 values were used by others [13, 6]. The present study found that these values for ingredients are well correlated within ingredient categories with the exception of acids and acid salts. For this reason, it should matter little which measure is used. Great variation occurred within ingredient categories with regard to ABC and BUF values. The pH and acid-binding capacity of ingredients commonly used in post-weaning pig diets was measured. The ABC values of complete diets can be predicted if the ABC of each ingredient in the diet is known. The observed and predicted ABC values were well correlated. Jasaitis et al. also found this to be the case. The result is that diets can be formulated using the ABC values for ingredients presented here so that complete diets with low ABC values are produced. Such diets can be used when a high gastric pH is likely to be a problem (e.g., at weaning). These diets could also be employed as part of a strategy to reduce E. coli or Salmonella in older pigs. This is particularly important now due to recent EU bans on feed antibiotics in response to human fears of antibiotic resistant bacteria originating in animals [2, 1]. The authors acknowledge the assistance of graduate students and work study students in performing the titrations recorded here. The provision of ingredient samples by Glanbia, Portlaoise and Dairygold, Mitchelstown is gratefully acknowledged.